NACA frequently organises technical workshops and consultations on aspects of aquaculture. The proceedings of such meetings are made available for free download. Audio and video recordings of technical presentations are also available for some meetings (please see the podcast section). NACA publishes a wide range of aquaculture publications including technical manuals, workshop proceedings, better practice guidelines and several serials including Aquaculture Asia Magazine, the NACA Newsletter and the Quarterly Aquatic Animal Disease Report. To keep up to date with developments you could consider subscribing to our free email newsletter service and RSS feed. Codes of practice and better management: A solution for shrimp health management? This presentation, delivered at the Sixth Symposium on Diseases in Asian Aquaculture (Sri Lanka, 2005), reviews the strategies adopted to promote a more sustainable approach to shrimp health management. It also presents and compares the experiences gathered to date, with the aim to identify an effective way forward for the sustainable development of the sector, and provides guidance on a way forward to implement better management practices with reference to small-scale producers. Presentation on a MPEDIA/NACA intiative to implement better management practices for shrimp farming amongst small-scale farmers in India via formation of farmer groups. The practices are based on the International Principles for Responsible Shrimp Farming. Adoption of improved farming practices reduces the incidence of disease and improves crop outcomes for small-scale farmers. 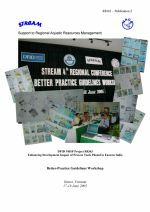 This presentation was made at the World Aquaculture Society Conference in Bali, Indonesia, 2005. 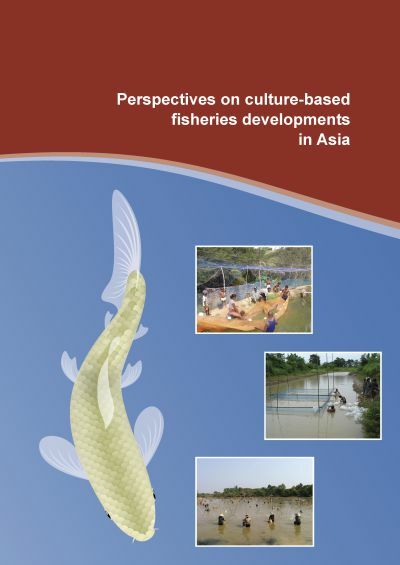 This is the report of an inception workshop for the Mekong Giant Catfish Working Group. The Mekong giant catfish Pangasianodon gigas is listed as critically endangered in the 2003 IUCN Red List. 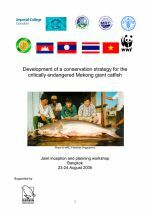 The purpose of the workshop was to exchange information on the current state of the Mekong giant catfish and the relevant conservation and research activities of key organisations, and to establish a joint planning process aimed at developing an overarching conservation strategy for the Mekong giant catfish. 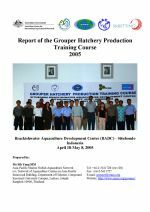 This is the report of the 3rd Regional Grouper Hatchery Production Training Course, which was conducted at the Brackishwater Aquaculture Development Center, Situbondo, East Java, Indonesia from April 18-May 8, 2005. There were a total of 17 participants coming from Australia, Brunei Darussalam, Indonesia, Malaysia, Maldives, Marshall Islands, Singapore, and Vietnam. The training consisted of a mixture of theory, practical and field trips for the participants. The objective of this project, in taking forward the achievements of the earlier projects, is to develop and promote mechanisms for the delivery of rural services that can reach and benefit marginalised poor men and women of scheduled tribes and scheduled castes. This workshop in Kaipara Village was meant to “understand the quality of performance in service delivery to poor people through the project monitoring and evaluation system.” Significant change stories were prepared by participants. 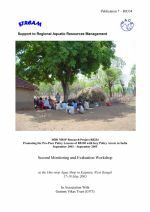 This workshop report is an output from an additional uptake and promotion activity of the DFID NRSP Project R8363 “Enhancing Development Impact of Process Tools Piloted in Eastern India”, which was extended to the end of August 2005. It describes a Better-Practice Guidelines (BPG) Workshop which was the latest project activity to share process tools for Building Social Capital (Self-Help Groups), Consensus-Building and Information Access Surveys. Since the project began, the BPG genre has expanded from the original three concepts shared, to currently twenty-five BPGs prepared not only by STREAM but also by farmers and fish producers. 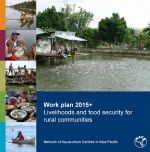 The genre has also been adopted by other organisations, including the DFID-funded Western Orissa Rural Livelihoods Project to share rural aquaculture techniques, and Stirling University to support the uptake and promotion of their work on Self-Recruiting Species and Local Resource User Groups. The workshop was attended by STREAM National Coordinators and Communications Hub Managers from Cambodia, India, Indonesia, Myanmar, Nepal, Pakistan, Philippines, Sri Lanka and Vietnam, and STREAM Regional Office colleagues based in Thailand, Australia and India. The participants reviewed and assessed the BPGs and Policy Briefs in Bahasa Indonesia, Bengali, English, Hindi, Ilongo, Khmer, Myanmar, Nepali, Oriya, Sinhala, Urdu and Vietnamese. They also began to plan how the uptake and promotion of these tools may be specifically supported in each national context as well as planning the development of further BPG and PB topics. 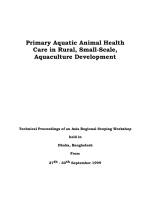 This document is the technical proceedings of the Asia Regional Scoping Workshop on “Primary Aquatic Animal Health Care in Rural, Small-scale, Aquaculture Development,” held in Dhaka, Bangladesh from 27 - 30 September 1999. The objectives of the workshop were to review information on socio-economic impacts, risks of disease incursions and health management strategies in rural, small-scale aquaculture and enhanced fisheries programmes; and to identify potential interventions for their better health management and appropriate followup actions. 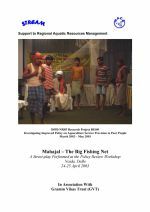 Mahajal – The Big Fishing Net was written by Mr Rakesh Raman, a playwright from Ranchi, Jharkhand, and performed by his theatre troupe. The play was written as an interpretation of the outcomes of the project case studies carried out in Jharkhand, Orissa and West Bengal. Act One sets the scene of fisherfolk’s livelihoods and the difficulties they face in a tribal village. Act Two places the project’s policy change recommendations within the context of their lives and aspirations. The workshop Indigenous Participation in Aquaculture – the Pacific Experience was held as a day-and-a-half session in the Australasian Aquaculture 2004, Sydney, 27–28 September 2004. The workshop promoted exchange of information and experiences between researchers, government representatives and industry involved in aquaculture development in the Pacific. 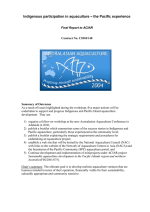 The workshop recognised the increasing interest in aquaculture as an industry that can provide benefits for indigenous communities in Australia as well as the Pacific Islands. This is the report of the “Yunnan DOA/NACA-STREAM/FAO Workshop on Livelihoods Approaches and Analysis” that was conducted in Mengzi, Yunnan from 6-10 September 2004. The purpose of the workshop was to develop and document mechanisms for training in livelihoods approaches and analysis, and to build national capacity to conduct livelihoods analysis. The workshop in Yunnan was the first STREAM event in China, with colleagues coming to participate from throughout the province.